I found this great biography of a special Native American, Don Coyhis. ‘Founder, White Bison, Purpose Prize Winner 2009. Coyhis developed Wellbriety, a substance abuse recovery program that taps the power of Native American culture, tradition, and community to help heal his people. Don Coyhis felt emptiness in sobriety. He found himself going through the motions at support group meetings, disconnected from the reasons why he shouldn’t drink. 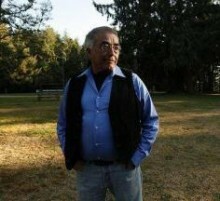 Searching for understanding, he turned to his Native American roots. During a five-day fast in the Colorado mountains, Coyhis saw a white bison rise from the ground – to him, a sign that his recovery would be incomplete without his culture. Coyhis founded a nonprofit offering native-focused recovery resources to communities across the country, and in turn, launched a movement called Wellbriety. Don Coyhis flies about 125,000 miles every year, delivering his message of sobriety to other Native Americans. But recently, the impact of his 20-year mission touched him in his own backyard. The woman didn’t know that the anonymous, ponytailed man in her meeting had started the Wellbriety Movement and spread it across the country. And Coyhis, having never met the woman, does not know how she came to learn of it. “It has taken on a life of its own,” he says. Over the past 50 years, alcoholism has ravaged the Native American population. A government study last year found the rate of alcohol-related deaths among Native Americans is more than three times that of the general population. Coyhis, 65, has trained thousands of people in the Wellbriety ways – both in person and through videotaped sessions, books, workshops, and even YouTube clips. He does all this with a five-person staff that works in what could pass for a dentist’s office, except for the Native American artifacts hanging on the walls. Coyhis himself could pass for a corporate executive, with his to-do list spelled out on a whiteboard, his cell phone clipped to his pants, his laptop open on his desk. But, unlike other execs, tears spill freely as Coyhis shares stories of the people he works with today. Coyhis grew up a troubled child to troubled parents on a Mohican reservation in Wisconsin. Drinking was the way of life. As an adult, Coyhis left the reservation – and his culture – for the business world, eventually landing a lucrative job at Digital Equipment Corp., among the mountains and big skies of Colorado Springs. He was a husband, father, and senior manager. “My wall was full of plaques,” he says. But drinking threatened to destroy everything. After Coyhis made a mistake at work, his supervisor told him that he either had to get help or go. Coyhis eventually met another Indian, “Johnny,” a recovering alcoholic. Coyhis looked up to him and implored Johnny to help retrain him, a now out-of-practice Indian, in the native ways. When Johnny took Coyhis on a five-day fast in the mountains, Coyhis saw a white bison rise from the ground and gaze upon him with loving eyes. “It was like my angel,” Coyhis says. It became clear to Coyhis that his recovery would be incomplete without his culture. After a decade of sobriety, in 1988, Coyhis formed White Bison to bring his ideas to his people. He worked nights, weekends, and vacations, but quickly found that his corporate training didn’t always serve him. Take the standard organizational chart, for example – the boss at the top and the greatest number of people at the bottom. That structure wouldn’t help an alcoholic on a reservation, Coyhis reasoned, when the greatest number of people must help the person who needs it most. Now, Coyhis’ chart is flipped. His methods include sessions not only with the alcoholic, but also the parents, siblings, elders, and others. To Coyhis, “recovery” is not only about the work that the alcoholic must do personally – Coyhis uses the “Medicine Wheel 12 Steps,” which are the Alcoholics Anonymous principles organized in a circle – but also the group drumming circles, the healing ceremonies, the service to the community. While in most cases, the alcoholic’s treatment consists of the alcoholic seeing a counselor or going to a meeting, Coyhis’ model begins by working with volunteers who have struggled with alcoholism and even their enablers, called Firestarters, and getting them to commit to sobriety and public service. Part of the recovery is inspiring others to be well, too, Coyhis says. And the model works. In a study of 326 of the first Firestarters that Coyhis trained, 309, or 96.9 percent, had lived sober every day after six months, says the author of the study, David Moore, a researcher at Argosy University in Seattle. Marlin Farley was struggling with his sobriety when he met Coyhis and became a Firestarter in 2003 in his community, White Earth Reservation in Minnesota. Wellbriety brought his community out of despair and denial, Farley says, and even helped reduce juvenile crime by more than 50 percent. In 1990, just as Coyhis was learning to balance his passion with his paying work, Digital Equipment Corp. announced layoffs. Although his position was safe, his supervisor knew Coyhis’ heart was elsewhere and offered him a $141,000 buyout. Coyhis took it and put every spare penny into building White Bison. Coyhis believes that many problems in Indian communities stem from the government-sanctioned boarding schools that Indian children were forced to attend beginning in the late 1800s. Children were made to cut their hair, attend church, and shun their native language and traditions. Sexual abuse was rampant. Many children did not survive the experience, he says. Many of those who did – including Coyhis’ parents – were so traumatized that they turned cold and unfeeling, even toward the younger generation. Coyhis’ affect on the health, wellness and happiness of the Indian nation is immeasurable, says Henrietta Mann, a Cheyenne elder and president of the Cheyenne and Arapahoe Tribal College at Southwestern Oklahoma State University. You can read more about Don and The Wellbriety Movement on our Sharing Culture website.